After yesterday’s story about Apple enforcing third-party promotions and possibly nixing iPad giveaways, we followed up with companies who are trying to give away the magical tablet. 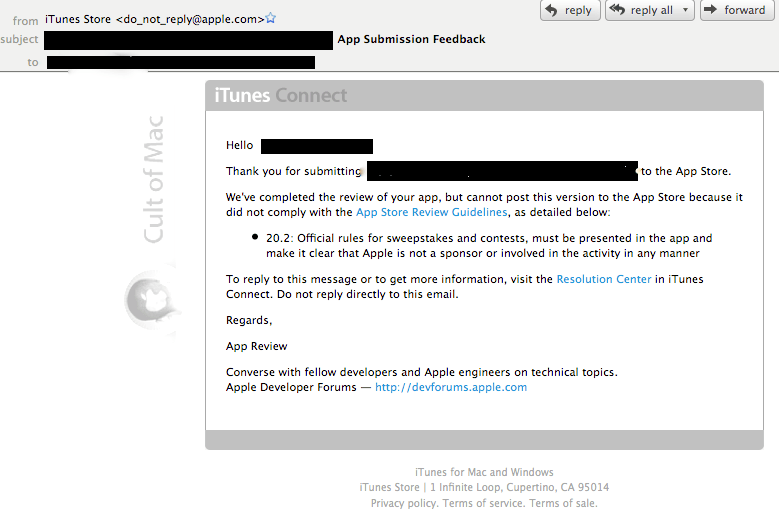 One of them got back to us with the following email from Apple, stating that an app had just been rejected because the company was found in violation of Apple’s giveaway guidelines. The CEO, who asked not to be named, told Cult of Mac the company has several apps pending approval in the iTunes store that they suspect are all in limbo for the same reason. Giving away an iPad was a crucial way to gain interest in the press and public, they tell us. The company had previously given away Apple products to drum up interest without any trouble from Apple. Now the App developer’s giveaway is in jeopardy, along with any potential loyalty from people who “liked” the company on Facebook in hopes of winning an iPad. Then again, so is the very viability of the app company if they can’t sell in the iTunes store. How should Apple handle its third-party promotions with developers?